Strong evidence has emerged to suggest that Democratic National Committee interim chair Donna Brazile passed a debate question to Hillary Clinton's presidential campaign officials before a CNN town-hall forum in March. Although it’s not clear how Brazile got ahold of the question in the first place, one plausible source is her former CNN colleague Roland Martin, who is now an anchor and reporter for News One. Martin was one of the moderators for that March town-hall event — and asked the question that Brazile apparently passed to the Clinton camp in advance. Brazile has repeatedly denied obtaining questions in advance from CNN and has suggested that her leaked emails to Clinton campaign officials may have been forged or altered by Russian hackers. But she has not directly denied receiving questions from Martin or News One. Her claims have been further undermined by researchers who have used publicly available email verification tools to confirm that the WikiLeaks-sourced message is authentic. The email in question was sent by Clinton staffer Jennifer Palmieri to campaign chair John Podesta and contained a quotation from a message from Brazile that had apparently been sent on March 12. 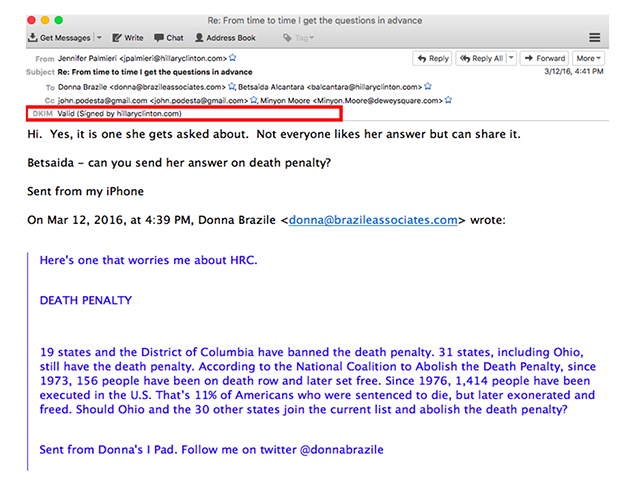 Brazile, who was the vice chair of the DNC and a CNN commentator at the time, has been dogged for months by suggestions that she provided a question about capital punishment to Clinton staffers before the town-hall event in Ohio. The question at issue was posed by Martin both to Clinton and her former Democratic rival Sen. Bernie Sanders. Secretary Clinton, since 1976, we have executed 1,414 people in this country. Since 1973, 156 who were convicted have been exonerated from the death row. 19 states and the District of Columbia have banned the death penalty. 31 states, including Ohio, still have the death penalty. According to the National Coalition to Abolish the Death Penalty, since 1973, 156 people have been on death row and later set free. Since 1976, 1,414 people have been executed in the U.S. That’s 11% of Americans who were sentenced to die, but later exonerated and freed. Should Ohio and the 30 other states join the current list and abolish the death penalty? As a longtime political activist with deep ties to our party, I supported all of our candidates for president. I often shared my thoughts with each and every campaign, and any suggestions that indicate otherwise are simply untrue. As it pertains to the CNN Debates, I never had access to questions and would never have shared them with the candidates if I did. The DNC interim chair also said that the emails released by WikiLeaks were not to be trusted, as they were likely altered by the Russian government at some point. “We are in the process of verifying the authenticity of these documents because it is common for Russia to spread misinformation and forge documents,” she said. Brazile’s explanation was contradicted by a report the next day from Politico that included the text of an email apparently sent by Roland Martin to CNN producers. Martin's email contained the exact words that were apparently passed along to the Clinton camp by Brazile. Interviewed by Politico reporter Hadas Gold, Martin said that he could not recall sending his questions to Brazile and did not know how she might have received access to his queries. His statement fell well short of a flat-out denial. By contrast, according to Politico, CNN explicitly denied sharing anything with Brazile, instead blaming Martin’s employer, TV One. Brazile stuck to her denial last week in an interview with Fox News, becoming confrontational when asked for more details about her version of the story. Notably, she only denied receiving debate questions from CNN, not from TV One. “I did not receive any questions from CNN,” she told anchor Megyn Kelly. "As a Christian woman I understand persecution, but I will not stand here and be persecuted because your information is totally false. Podesta's emails were stolen. You're so interested in talking about stolen material; you're like a thief that wants to bring into the night the things that you found that was in the gutter." Further evidence that undermines Brazile’s denial has emerged by way of a standard email verification method known as DomainKeys Identified Mail, or DKIM, which indicates that the WikiLeaks-provided message sent by Jennifer Palmieri on March 12 from her Hillaryclinton.com account is not forged. DKIM is commonly used by email delivery programs to prove that a message is genuine and has actually been sent by the server specified within the email. It can also be used by anyone who downloads the Mozilla Thunderbird email client and subsequently installs the DKIM Verifier extension. DKIM allows the administrator of a mail server to set a unique digital key that other servers can then use to cross-check messages they receive. If the received emails do not match the domain they claim to be from, many servers will reject the message or flag it as forged. Using the Thunderbird software described above, Salon has verified that the DKIM signature from the message provided by WikiLeaks indicates that the message was indeed sent by the Hillaryclinton.com domain. Other websites have also performed this validation, including programmer Daniel P. Johnson, who was first to do so. Security researcher Robert Graham has offered a $600 reward to anyone who can construct a forged email message that will validate via DKIM. So far no one has collected the bounty. 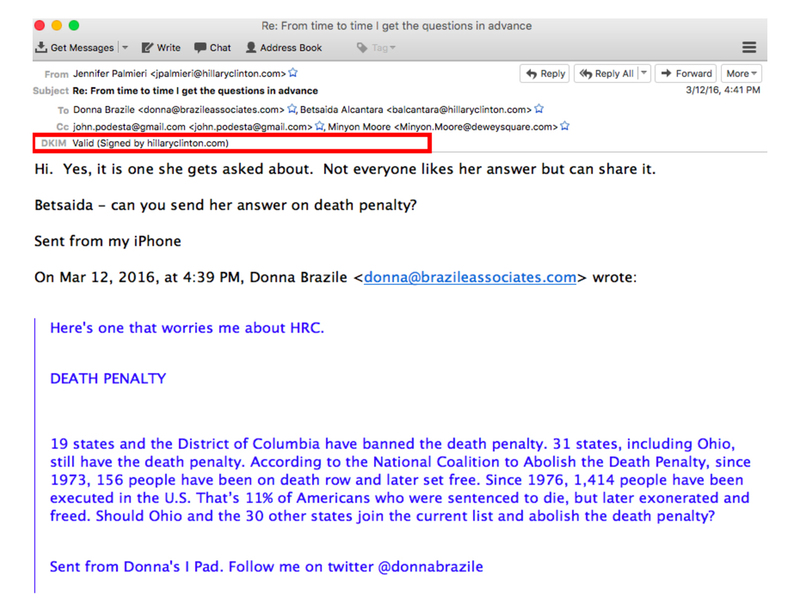 Representatives for Donna Brazile and the DNC have not responded to Salon’s repeated requests for comment about the DKIM verification of the Palmieri message. Occasionally, email server administrators will change the DKIM signatures of their domains. Therefore, it is possible that at some point in the future the Palmieri message will not pass a DKIM authentication. Brazile is the second DNC chair to be accused of favoring Clinton over Sanders based on hacked emails released by WikiLeaks. Her predecessor, Debbie Wasserman Schultz, was forced to resign in July after she and several senior staff members were revealed as having discussed strategies to undermine the Vermont senator’s presidential campaign.